Friday Funny – Guardian publishes a story about Earth 'raising the white flag' due to disappearing ice, then disappears the story | Watts Up With That? Fortunately, the Internet has a memory. Here’s some excerpts from the story by Damian Carrington. After reading it, I can see why they disappeared it. Our planet is waving the white flag of surrender. But as the polar flag becomes ever more tattered, with holes scorched by hotter ocean waters, humanity pumps ever more globe-warming gases into the air. In 2007, a new record was set for the minimum summer sea ice cover in the Arctic had halved. This furious flag waving attracted attention. That year, the world’s scientists declared the end of any doubt that our addiction to burning fossil fuels was changing the face of the planet. Al Gore expounded his inconvenient truth and the world seemed set to act. Today, that 2007 record is smashed and the shredded white flag is now flickering rathering than flashing. But the danger is greater than even, even if the alarm signal is frayed. Decades from now, will today’s record sea ice low be seen as the moment when our Earthly paradise gave up the ghost and entered a hellish new era? I sincerely hope not, but with this global distress signal failing to attract attention, I fear the worst. UPDATE: It was offline earlier. I guess now that we showed the cat was out of the bag they decided to put it back online. Reminds me of the end of a Rocky and Bullwinkle episode. I thought Obama was supposed to be fixing this? What would we do without the Grauniad to keep us on our toes (banging our heads against the wall…. This isn`t the first time, either. The Guardian is a joke, initiating Custer`s Last Stand by hanging their hats on Arctic ice. Was it 0.06% of the cryosphere that disappeared during this season`s melt? The Guardian has become quite a national embarrassment. It is a left wing version of the Daily Mail but takes itself seriously. And as the overweight burden of hyperbole sinks slowly in the west…. To any warmist out there: when (not if) the ice finally disappears and nothing disastrous happens, will you finally shut the f*ck up? Personally, I don’t know what you lot are moaning about, that was quite a good piece – for the Guardian! Clearly, they posted the article too soon. The sea ice is scheduled to disappear in eight days. Let’s see if they re-post it next week. “The last great global ice melt the planet witnessed came 10,000 years ago at the end of a deep ice age. As glaciers retreated, a benign and balmy climate emerged in which the human race has flourished. Our entire civilisation is built on the warm soils left as the ice sheets melted. To paraphrase: Ice melt and warming 10,000 years ago; very, very good. Ice melt and warming present time; very, very bad. Can you say: non sequitur? The Guardian is slowly crawling up it’s own backside. Eventually it will suffocate itself and die. Only ecofascists and barmy left wingers go near it. Total sea ice < 10% less than LTM. Disaster disaster!! South Pole sea ice 0.95m sqm more. LIA, LIA!! This got me a blank look and a repetition of his original “experiment.” I pointed out the impossibility of HIS experiment and the actually ongoing nature of MINE. Still no response. Anyone notice what is happening in the Antarctic? Seems the Antarctic sea ice is considered a regional event but the Arctic sea ice is a global affair. Why? Or those who, like me, love a good laugh. With all this “melting” and “raising the white flag of surrender” going on the Wicked Witch of the West must be getting very nervous, very soon the Guardian will expect the only thing left in the Arctic will be a few “Munchkin Men” and a pair of ruby slippers. As the data suggests as Arctic Sea Ice decreases Antarctic Sea Ice increases, isn’t there some sort of pattern to this? I dare say we’ll have Lucie Seigle (Grauniad Journo, ecosocialist) doing her little bit on the One Show magazine prog for the BBC any time soon. The Beeb News covered it a couple of days ago, ratchetting it up with all the hype & the soon be “ice free in the summer”! Never mind that the Arctic ICE VOLUME has essentially tripled or more since 2007. These guys live in a 2-D world. Would they be happy if the Arctic was ice covered but only 1 inch thick? THEN they would be touting ice thickness and not the area. Ice volume is the only real measure in the Arctic as storms and winds can pile the ice up into small areas, masking the thickness below. Because Antarctic ice is increasing. That was an easy one! The story of the Arctic ice cap is the story of modern environmentalism. In 1968, as satellites began to document the vast ice field blanketing the north pole, the iconic Earthrise image was beamed back to the ground. It revealed a planet of awesome beauty, deep blue oceans, verdant continents and crowned with at least 8m square kilometres of gleaming ice. The image kickstarted the global green movement. Huh? This passage is riddled with inaccuracies. First, satellites did not begin to document Arctic sea ice until 1972, not 1968 as claimed. Second, the famous Earthrise image was taken by Apollo 8 astronauts on December 24, 1968, and the Arctic is NOT visible because it was the boreal winter. Third, if the Arctic were visible in the Earthrise image, the sea ice extent would have been much greater than the 8m square kilometers claimed. It probably would have been closer to 13m square kilometers. Finally, there are only two continents visible in the image — Africa and a tiny piece of Antarctica — and neither of them is “verdant” (lush green). Some have observed that no one much reads the Guardian. Unfortunately, the BBC take more copies of the Guardian than any other paper, and recruit virtually exclusively via that paper. ‘Nuff said! I suppose looking at arctic sea ice alone and drawing conclusions about global warming is cherry picking. Maybe they should mention world sea ice when referring to global warming and arctic sea ice when referring to regional climate change. Hey, give the guy a break. I’ve got a soft spot for purple prose, and Damian Carrington is darn good at it. He’s probably got a good novel written, but can’t find a publisher. So he had to get a day job. He fails to mention the short length of the measurement period in which that 2007 record appears. He’s too busy finishing up his live performance in an improvised play that’s loosely an updated rendition of the Carter presidency. Here at the end, it’s a consulate instead of an embassy and some other actors forgot to take that group hostage, possibly understandable as numerous other actors have already taken and are holding American hostages. But with American savings, jobs, competitiveness, value of currency, and worldwide prestige all heading to or already in the crapper, it sure looks like it’ll stay faithful to the original’s ending. Strange that the global temperatures from the satellites (like UAH) saw nothing unusual about this year temperature-wise. Neither the Danish Meteorological Institute temperature north of 80N, normal. Could this possibly just be ocean currents at work? Seems more that likely to me, bottom up and not top down. Ocean floor volcanic action may be the other possible explanation. Either way I see no co2 involvement from above or am I missing something? Hahaha! I bet he was tempted to use the word “Utopia!” What a bed-wetting idiot. I clicked the old-news link, got fed up waiting for the rotating thingie to finish and the page to appear, so came back, read the post, and the comments, then followed the revivified Guardian link, read that and ran off a pdf of it, then came back … and the rotating thingie was still rotating on the old-news tab. Ironically, it looks like the old-news link that isn’t working, for me at anyrate. Must be all those WUWT visitors doing their server in. Perhaps I should send on to poor little Damian. Am still unsure as to whether his sneer in the Guardian’s mug shot of him is worse than little Leo Hickman’s. Probably the best mechanism to explain how ice ages develop evolves little/no ice in the Arctic Ocean around end of summer and a cooling planet at the same time. Ideal conditions for snowfall in regions that are usually fairly dry and cool in summer, giving increased risk of snow failing to complelely melt the following summer. I know most on here are sceptical, as am I. 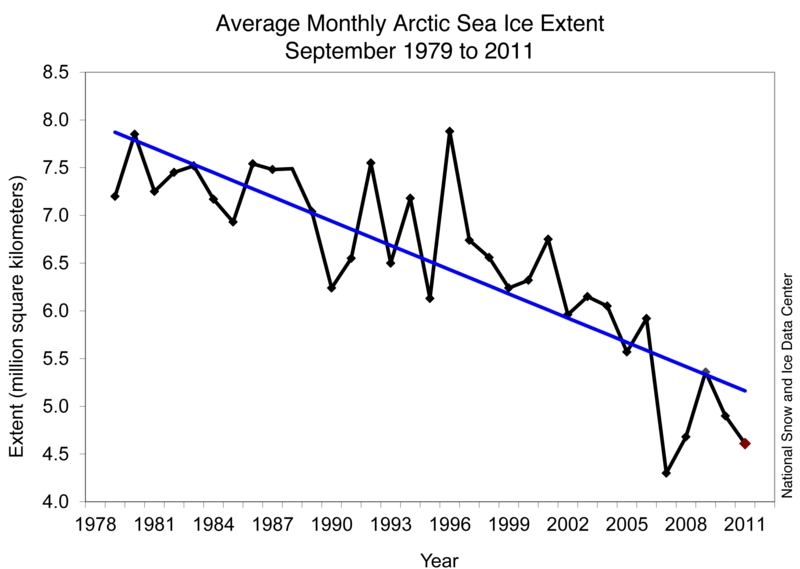 But I do find the reduction in arctic sea ice worrying. Maybe this is just a human fear of change. The evidence suggests it really is happening and not some figment of someone’s imagination. Will it continue? Will that ice retreat and the Antarctic ice expand? What will this change mean for us? Plenty of questions, I don’t pretend to know the answers. So many attacks on a piece of journalistic exaggeration. So little questioning as to why the arctic melt this year has smashed the 2007 minimum – and the melt is continuing. That good to know then. So why the big melt ? Large positive anomalies in sea surface temperature and air temperature. NASA GISS for August is now published and shows a 0.56 C anomaly globally cf 1951-1980, with most of the arctic showing big anomalies (again) particularly north of Canada and Greenland. BTW I don’t read the Grauniad. Actually, if you were paying attention you would have known from the start it’d be a lousy year for the ice. A lot of thin first-year ice, including that bump-up at the end of the freeze period that was guaranteed to go away quickly. And the weather patterns have been screwed up lately. The contiguous US had an all-time record high July while the rest of the planet was running cooler. Screwy weather patterns like that lead to interesting storms, as seen in the Arctic. So with so much thin ice and so little multi-year ice, the Arctic was pre-conditioned for a large loss this year at the start. Add the freak storm that tore up so much ice, which should well have been expected, and this year is not surprising. BTW, why bother mentioning “…the melt is continuing” anyway? By the IARC-JAXA graph I can see about another week of melt is within historical norms. Besides, looks bottomed-out anyway. But you are wrong. The ice conditions are a factor, but the melt trend, and this year’s massive melt, is continuing mainly because the arctic is warming. Your “weather patterns have been screwed up lately” is global warming. The USA has had its hottest recorded year to date and that heat has extended north over Canada and Greenland, accelerating the melt. The excuses are running out. Even if all the Arctic ice melts, sea level will not rise one single centimeter. Ice floats, and the Arctic ice cap is essentially the world’s largest floating ice cube. Antarctica is gaining ice mass (see previous thread) and the Greenland ice cap will take 1500 years to melt, per Dr. Susan Solomon, U.S. delegate to the IPCC and AGW defender. So, to the Guardian reporter–why the panic? The PLANET is fine, and if it warms by a few degrees C., we may be on the way to a new higher equilibrium temperature. Big deal! We humans may not like having to abandon cities like New York, Boston, New Orleans, Amsterdam, or Copenhagen, but what ever happens, we are going to have plenty of time to adapt to new realities! “Tipping points” are a Hansen-created and sponsored myth. But why let real meteorological science interfere with your confirmation bias? The Guardian has a very good free Sudoku page. I appreciate and apologise for this not being strictly on-topic but what does Prof Viner think of this? Eeek….meant ‘I appreciate that that this isn’t strictly on-topic and apologise’…………..sounds better? Wrong again. We are not into a full blown El Nino yet – and it may fizzle out anyway. Fact is that the USA has to date seen its hottest recorded year without an El Nino. And can you explain why you think I have a “confirmation bias”. Why is it that sceptics so often resort to insults when challenged ? I am happy to state that the antarctic sea ice is not following the arctic trend and that the large positive temperatures anomalies in the far north are not being mirrored (widely) in the far south. I am happy to state these things because thats what the data says. Can you please say what the natural cycle is that is causing the arctic ice cap to melt – so fast ? Really ? What do you think will happen to the glaciers in Greenland, Baffin Island and the rest of the arctic if the sea ice goes ? No glacial acceleration due to mechanical change (loss of coastal sea ice) ? No increase in air temperature due to loss of ice refrigeration of surface air ? No feedback effect of albedo change from light to dark surfaces ? No it looks like those glaciers will be just fine in glorious isolation surrounded by warming seas and atmosphere. You have been smacked about with knowledge here before and now you are back for more? You have NOT read ANYTHING posted to you and that is made obvious by your odious post here. Did you think no one would notice? So tired of going over the same old hackneyed arguments from uninformed planet savers. Abbott, take your fingers out of your ears and READ the response to you. Kadaka did not say we are in a full blown el nino. READ HIS DAMN POST!!! It is like you have NO reading compression. 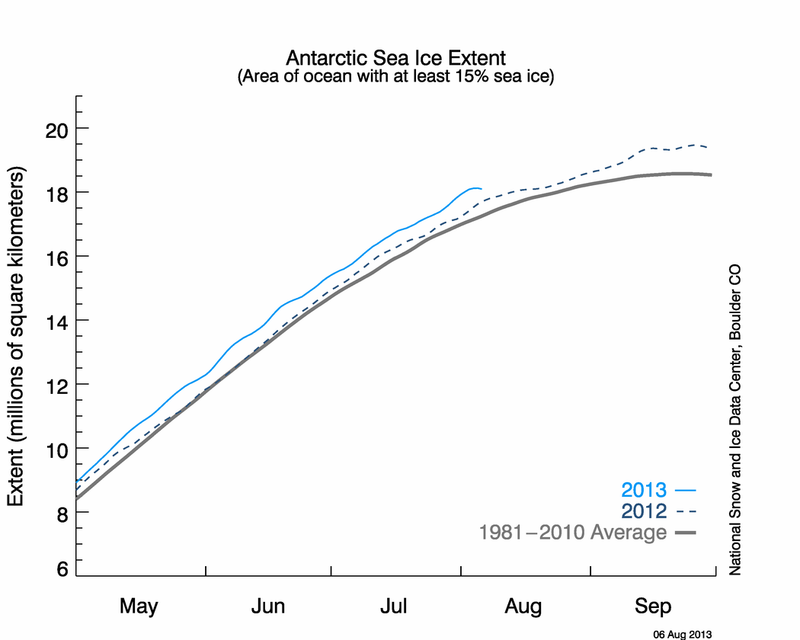 It looks like Antarctic sea ice will be a record maximum extent for the satellite era. I look forward to hearing how GHGs can simultaneously cause a record minimum Arctic sea ice extent and a record maximum Antarctic sea ice extent. Compression or comprehension, they both work. That last question about the Antarctic ice cover sparked a question………When we were in the throes of the last ice-age which I understand manifested itself in the northern hemisphere in the main what was the south pole doing? Don’t put the boot in too hard, I’m not asking a ‘leading’ question….Just interested. Insults are the backstop when argument fails for too many sceptics – plus the usual ‘you are not welcome here’ line. Do you think that putting text in caps with lots of !s makes it any more valid ? So long as Anthony allows me, (and I appreciate it is his site) I will look forward to being able to make more postings in the future and will not be scared off. Still waiting for a response to my questions though, which I will read with my eyes and not my ears…. Where did I say any of these things? Where did I insult you? Respond to what Kadaka ACTUALLY said. The simplest explanation is the most likely explanation. None of your speculative (at best) explanations necessary. You also need to show that the Arctic is doing anything that it has not done in the past. But you cannot as there is no data to support this. Stop whining. You get off scott free compared to the treatment I get at ANY pro-warmist site. Will try to find more, but have both kids at the mo. Are there data and graphical representations of this anywhere? A large increase in Arctic ice volume since 2007 is something I haven’t seen numbers for. I read a lot of stuff about temperatures, solar cycles, cyclone and tornado activity, etc., but I don’t remember seeing anything much about Arctic ice other than wind patterns and sea ice extent (area). I would be fascinated to see numbers showing a trebling of Arctic ice volume. Is this actually true? If so, then the latest scare mongering by warmists could be addressed in a more easily understandable way. And we need to keep it very basic for our wide-eyed alarmist friends. Warmist members of the public are almost exclusively very simple people with little or no understanding of science. This is how the U.N. and their political representatives in America, Europe, Australia, etc., have made such progress with their CAGW agenda, despite the complete lack of corroborating evidence. Every man and his dog knows greenhouses keep plants warm, so the ‘greenhouse gas’ scare was an easy sell, even though the atmosphere doesn’t behave anything like a pane of glass in a greenhouse (and recent re-calculations of Earth’s planetary greenhouse effect indicate we would only be 10K cooler without it, rather than the 33K commonly touted). The only thing the warmists have at the moment which shows any plausible positive correlation with the Global Warming theme is a cyclical decrease in Arctic sea ice extent (which was much lower 7000 years ago anyway). For this reason, papers like the Guardian and other MSM will be hammering away at it for all they’re worth – after all, they have nothing else in their armoury but failed computer models. If we can demonstrate a large increase in Arctic sea ice volume since 2007, I think this would help to relieve their anxiety. 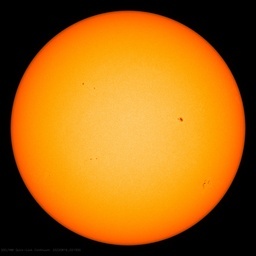 Then the advent of solar-mediated global cooling, expected by solar physicists to become apparent over the next two winters, will finally put CAGW to rest before it has caused too much economic damage. Okay, I’ll attempt to give a response. First, you are putting words in my mouth with your ridiculous statement that “…those glaciers will be just fine in glorious isolation…”. I didn’t say that melting wasn’t occurring; merely that the rate was relatively slow. This is especially true with respect to the more hysterical statements by Hansen et al. Your “Baffin Island” issue is a joke; the glaciers there would make a contribution to sea level that’s in the noise. Ditto “the rest of the Arctic” glaciers. As to Greenland “accelerating melt”, for whatever cause, again, so what? Right now, the estimate I have heard out of non-hysterical portions of your warmist camp is 1500 years for the entire Greenland cap to melt. In addition, there have been published papers showing that the Greenland ice sheet did not completely melt even when temperatures were 5 degrees C. greater than the present; so there is some doubt as to whether the entire Greenland ice sheet would melt. Assume the worst–that the entire Greenland ice sheet melts. Assume there is some acceleration for whatever reason. Acceleration by a factor of 7 is still over 200 years for the sea level to go up by an estimated 7 meters. That is more than enough time to apply whatever mitigation strategy we may work out. Thank you kindly Dr Ball. Your casual assertion that Arctic ice volume has “…essentially tripled or more since 2007…” really caught me off guard. I’d like to join Interested in asking for the source for this statement. Why do these people hate warmth and hope for cold and ice? I for one don’t care if every bit of the ice melts. This planet has existed in the past without ice and yet life still flourished and evolved. Why wouldn’t life flourish in the future when all the ice is gone? Do they not find fossils in Antarctica. In fact they actually find wood. Is it better off covered with ice? James Abbott, often the most obvious and simple explanations are by far the over riding cause of things. It has been noted that the sun for the later half of the twentieth century was in a state of high excitement , this it would seem pumped a bit of extra heat into the oceans. It can also be noted that at this time the sun is resting. There is a lag in a dynamic system as large as the earth and looking at the ocean heat anomalies you will see that the excess ocean heat has meandered north and impinging on the sea ice. This is a negative feed back dumping heat, ultimately to space. This warm water in the north can lead to extra snow and bad winters in the northern hemisphere. Conversely down south the warm waters moving poleward are mixed by the circumpolar currents and do not make a lot of difference. It can also be noted that the Antarctic reacts quickly to the state of the sun and has been cooling for quite some time. Up north again, negative feed back mechanisms in a system so large tend to overshoot especially when the extra heat coming in the system stops coming as is the case with a quite sun. Summers come and go and are rarely notable, winters are the enemy of mankind. Really ? What do you think will happen to the glaciers in Greenland, Baffin Island and the rest of the arctic if the sea ice goes ? No glacial acceleration due to mechanical change (loss of coastal sea ice) ? None of the Greenland glaciers reach the open ocean, so loss of sea ice will have no direct effect. No increase in air temperature due to loss of ice refrigeration of surface air ? This doesn’t mean anything. The main effect of loss of sea ice is increased ocean evaporation, which will cause increased snowfall over Greenland and increased ice mass. No feedback effect of albedo change from light to dark surfaces ? Increased snowfall will increase Greenland’s albedo. If you are referring to ocean albedo, then ocean evaporation is much larger heat flow, and sea ice loss is a negative (cooling) feedback. Sorry if you feel offended. However you have failed to respond to my observation, made at 10:11 on Sept 14, before you commented. How do you explain the failure to note an area of ice 30 by 11 miles, (330 square miles,) to be noted on maps? Also, considering “new” ice is around ten feet thick at most, how do you explain some of the noted ice being 80 feet thick? Could it not be ice that was piled up by that mid-summer storm? By next spring the ice will again be ten feet thick. Even if it is only three feet thick, that is plenty thick enough for female Ringed Seals (the main food for Polar Bears) to escavate dens in, and have pups in. Ringed Seals are the only seals that can survive up there when the sea is totally ice-covered. They have claws that can keep air-holes open. The females dig a den at the top of the air hole, in the softer snow that exists on top of the ice. Female Ringed Seals do not have pups now, when the ice is scattered. However environmentalists claim the lack of ice will endanger the seals. They are sueing, costing the tax-payers money and making it harder for oil companies to drill. Considering this sort of frivolous lawsuit hurts the local economy in Alaska, you can expect some people to be grumpy. When you mess up another’s ability to earn a living, you had better expect comments that are less than polite. Wow…ok I’m going to have to be a lot nicer than I would like to be with this post. I will also go very S L O W so you might be able to wrap your mind the things that I am saying. You said I discounted an ice free arctic…I’m really baffled as to how you can draw that conclusion from my post other than extremely, and I mean mind bogglingly extremely poor reading comprehension. W H E N not I F the ice disappears. Ok. Let that sink in a minute. That means I’m *E X P E C T I N G A F U L L M E L T* am I not? Let me know when that lightbulb goes off. The BBC were doing the same thing recently – having their cake and eating it. Global Warming causes heat and drought in 2011. Global Warming causes cold weather and floods in 2012. I am utterly disgusted with the BBC’s contempt for real science. Some have observed that no one much reads the Guardian. Unfortunately, the BBC take more copies of the Guardian than any other paper, and recruit virtually exclusively via that paper. The BBC takes half the Grauniad’s print run. If it were not for the BBC, they would have been bankrupt the minute Nu Labour were kicked out of office (Labour kept the Grauniad going with millions of adverts for ‘Five-a-Day Officers’ – (don’t ask…..). It may not be a big Sunspot cycle, but we are nearly at its peak. And NW Europe had its coldest and wettest summer ever recorded. So remind me, what does Gloabal warming cause? Ah, yes, George Orwel told us many decades ago. Global Warming causes a great deal of hot-cold, and even more dry-wet. Can someone explain what this ‘story’ is all about because all I can see here is an article written with links to a Guardian piece (which I originally read last night), which an update then says is now still on the Guardian site although it was supposedly not there before. And all the links go to the same article ! When did it disappear ? What is meant by “I can see why they disappeared it” – what can be seen ? What is meant by “we showed the cat was out of the bag” – what cat, what bag ? How come I can’t see the story at the oldnews.co.uk link – can someone specifically tell me where it is, please ? When did Tom Nelson notice it had ‘disappeared’ ? Generally, what is going on with this story ? It looks like a conspiracy to me, so some enlightenment as to the facts here would be great. In that case, you’ll love this: Fall is approaching. The NYT has the scoop. You freakin’ homicidal idiots. Aren’t you at least going to try and say SOMETHING about the ice disappearing? Please, say something specific about the ice, rather than hint that you know something we don’t. Why is it disappearing? You say it’s not? It’s cyclical? It doesn’t matter? Or it’s not us? Please, be as verbose and specific as possible in your delusional responses so that when, in a few years after the Hague has started calling the Denialists to account, we can diagnose specific mental disorders that may be exculpatory for you. Son V. Nghiem of NASA’s Jet Propulsion Laboratory, said that “the rapid decline in winter perennial ice the past two years was caused by unusual winds. “Unusual atmospheric conditions set up wind patterns that compressed the sea ice, loaded it into the Transpolar Drift Stream and then sped its flow out of the Arctic,” he said. When that sea ice reached lower latitudes, it rapidly melted in the warmer waters. This paper shows that there is more ice now than the average of the past 9000 years. As we can see, we are currently in an ideal “Goldilocks” climate. There is nothing unusual or unprecedented happening now or on the horizon. Further, routine and abrupt temperature changes have happened naturally without regard to CO2 levels, which follow ΔT. To claim that the planet has warmed from 288K to 288.8K is due to human activity over the past century and a half is fine, so long as you understand that it is simply a conjecture, not a testable hypothesis. The same applies to the natural variability in polar ice cover, which as I’ve shown has many natural precedents on century and even decadal scales. Anyone who looks at a chart like this, and then claims that at times during the Holocene polar ice cover was not naturally less than curent ice cover has an agenda that has nothing to do with science, and everything to do with keeping the grant gravy train rolling. And another emotional uninformed cheerleader for the “cause”. As usual, brings NOTHING to the table but spittle and vehemence. I care just as much (probably more) about the environment and have spent a good deal of my life in the wilderness. Listen to my words; It is civilization that is tenuous, not nature. If you know ANYTHING about ANYTHING, you will know this to be true. As for the Antarctic sea ice trend (a) it’s a very slight trend to an increase, compared to the sharp trend to a decrease in the Arctic; (b) it isn’t nearly enough in absolute numbers to balance out the Arctic drop in sea ice, resulting in a net fall in area and extent(http://arctic.atmos.uiuc.edu/cryosphere/IMAGES/global.daily.ice.area.withtrend.jpg), (c) what matters visavis albedo changes for the climate is summer sea ice extent, not winter, since there’s no sun to reflect in winter, and (d) it’s happening alongside a fall in Antarctic land ice volume. And as for whether this year is a fluke due to weather conditions, or part of a long-term downwards trend… I’d like to put two things forward. First, the prior progression supports a downwards trend (http://nsidc.org/images/arcticseaicenews/20111004_Figure3.png). The September 2012 average looks like it’ll be a new record, somewhere below 4m square km, unless we see an unusually rapid refreeze (I’d eyeball it at about 3.75m square km over the month so far, based on the graph here http://nsidc.org/arcticseaicenews/). So what might the next couple of years tell us? How about: if the 2013 and 2014 Arctic summer sea ice extents go back to the 5.5 to 8m square km seen between 1978 and 2006, they’ll contraindicate a melting trend strongly; if they go back to the 2008-2011ish levels of around 4.5m to 5.5m square km, depending on where they are in that range they’ll offer either contraindication (5 to 5.5m) or ambivalence (4.5 to 5m); if they’re in the 4 to 4.5m square km range, they’ll indicate a melting trend; and if they’re below 4m square km again, expecially if they’re even lower than the 2012 record we’re seeing now, they’ll strongly indicate such a trend. Any views on this natural experiment, or bets? (I’d be very unwilling to bet, but based on what we’ve seen, I’d be surprised if 2013 and 2014 were either below 3m or above 5m; anything within that range seems possible, however). Does that mean it would be much cheaper to string a net across the exits to the Arctic Ocean, than to cut down on CO2? If it keeps the bed-wetters happy, and our taxes lower, why not do it? Changed my mind on betting: I would be happy to offer the following bets. The terms of each individual bet are even-odds, promising to give US$10 to a charity of the opponent’s choice if you lose (my charity of choice being Doctors Without Borders). 4) There will be another new record low September monthly average within the next five years. 5) The three-year average September extent for 2013-2015 will be lower than the three-year average September extent for 2010-2012. (All bets are based on the NSIDC September monthly average, in case it isn’t clear). Please respond within a week if you’re responding to the first bet; otherwise, any time you like before the end of the year for bets 2 to 5. I’m happy to consider other bets you may put to me as well. 3) No year between 2013 and 2017 will have an average of greater than 5.5m square km. Alternatively, to give a more specific contradiction, what about the Petermann glacier: http://en.wikipedia.org/wiki/File:Greenland_tmo_2003186.jpg ? Yeah..this is mainstream media in a nutshell..They just throw out stories..merely lies.. especially about the arctic or [Antarctica] area…It’s just four or five years ago..they printed lies about the penguins in [Antarctica] was almost extinct..cause the ice was melting…Turns out there are more penguins than ever…Same story about the arctic polar bear…They thttp://wattsupwiththat.wordpress.com/wp-admin/edit-comments.php?comment_status=moderated#comments-formhrive..and population is growing…Media can tell lies on anything regarding the polar areas..cause..after all..how many of us are really able to go check if it’s true?